Canon today releases the hybrid PowerShot S1 IS compact digital camera. A fully featured and well specified 3.2 Megapixel digital still camera with a 10x optical zoom, the PowerShot S1 IS is also a quality digital video camcorder, with capacity to shoot clear and natural video clips with 30 frames per second VGA resolution and high quality sound. An optical Image Stabilizer is featured, limiting blur in digital stills and keeping video footage steady. The 3.2 Megapixel sensor and Canon's image processing algorithms allow enlargements without image degradation up to A4 in size. The PowerShot S1 IS features an f/2.8 - f/3.1, 38-380mm (35mm equivalent) zoom lens. Optional wide and tele-converters are available to extend the lens range from 26.6mm right up to 608mm. The zoom is driven by a tiny ultrasonic motor (USM). The motor uses ultrasonic frequency vibrations to drive a tiny rotor which is fast, powerful and highly responsive. In digital still modes it drives the zoom at maximum speed, while in video mode it slows for a smooth effect and runs virtually silent, avoiding interference with video sound recording. 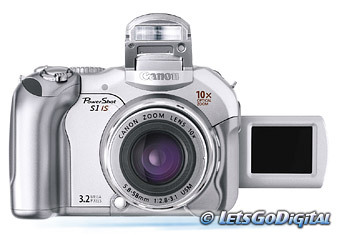 Optical Image Stabilizer: The PowerShot S1 IS features Canon's shift-type optical Image Stabilizer (IS) technology. IS significantly reduces the effects of camera shake, important with cameras such as the PowerShot S1 IS that have high magnification lenses. Tiny movement detection gyros and a correcting lens element counteract the effects of lens shake to deliver sharper final images. The resulting compensation is the equivalent of between 2 and 3 extra stops, which means the camera can be used at slower shutter speeds without a tripod without any detectable increase in image blur. With its combined large f/2.8 aperture and image stabilization, the camera performs remarkably well in low light conditions. True Movie Capability: Smooth, flicker free, clear and natural movie clips may be recorded to the camera's CF card in 30 fps VGA resolution. Moreover, zoom, auto focus, auto exposure and auto white balance all work during movie shooting. Quick and easy shooting is provided by a large "Movie" button on the rear of the camera. Footage of up to 60 minutes or 1GB can be recorded in a single shooting (at QVGA/15 fps mode). Auto focus and exposure metering: The TTL auto-focus options have been designed with both the still photographer and camcorder user in mind, and include FlexiZone AF/AE point selection and AF lock. The camera has a closest focusing distance of 10cm (W) and 93cm (T). Exposure metering is selectable between evaluative, centre-weighted average, spot (centre or linked to AF point). Easy Review and flash: A vari-angle LCD makes for easy framing from candid or high/low viewpoints. A built-in flash can be set to operate automatically, always on or always off. It features a red-eye reduction mode, flash exposure lock and second curtain synchronisation, often used in night photography to create an image of blurred lights trailing a moving lit object. Purpose built processor: Built into the PowerShot S1 IS is Canon's DIGIC processor, the dedicated image processor now found in all Canon digital cameras up to the EOS 10D Digital SLR. By integrating all image processing algorithms onto a single chip, the purpose-built DIGIC processor has underpinned much of Canon's success in the digital camera market by delivering fast write times, minimal shutter lag, optimal image definition and consistently precise and natural colour reproduction. DIGIC also makes the camera highly responsive, all but eliminating the phenomenon of staring at the back of the camera waiting for an image to display. iSAPS technology reads camera settings and environmental data to predict the most likely scene and makes adjustments accordingly. 13 Shooting Modes: To cover every conceivable still and video shooting situation, the PowerShot S1 IS has 13 shooting modes and six photo effects. Shooting modes include Auto, Program, Shutter speed priority, Aperture priority, Manual, Custom, Portrait, Landscape, Night Scene, Fast Shutter, Slow Shutter, Stitch Assist for capturing panoramas (for later merging with PhotoStitch software) and Movie. Photo effects include Sepia, Vivid, Low Sharpening, Black & White and Custom. The camera also has an interval timer function, capable of automatically taking a series of photos at regular intervals. Shoot underwater adventures: An optional waterproof case allows the PowerShot S1 IS to be taken to a depth of 40m for digital stills and movie footage capture while surfing, diving, snorkelling or skiing.